by gillian claire: friday thoughts on motherhood. it's been a pretty busy week for us. my husband has been working up in the mountains at a different location this week. that means longer hours for him and jealousy of his awesome scenery on my part especially when he saw baby big horn sheep - ugh! also, i started a new job this week as well! we are feeling super thankful that things might start settling financially a little bit for us the rest of the summer. it's a good feeling for sure. today, aaron will be at work and my plan is to take the boys to the park. we had been walking to the park pretty often in the beginning of spring but it's a bit far and i kind of stared losing the ambition. we usually go for a short walk while aaron's at work and every night we talk a long neighborhood walk as a family. i'm trying to step up my game though and strive to do a little more with the boys. currently in my life, i am just not that mom that religiously takes my kids to the library and park dates and splash pads etc. etc. i've never really been that mom and i don't think i really have to either but i also know that a small gesture such as taking my kids to the playground or for ice cream can feel like a big, fun event to them. this year has been stress on top of stress on top of tragedy for me and often i'm left kind of going though the motions and wondering, "what kind of mom am i?" 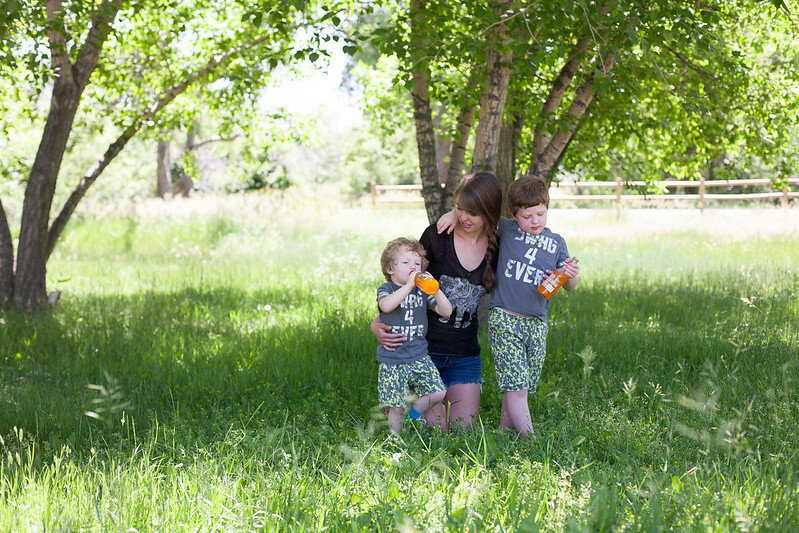 i've always felt so convicted and passionate about the way that i intended to be as a mother. i have always been super laid back when it comes to routine and rules but at the same time super devoted to ideas of how my boys would be raised. right now i just feel sort of lost between still being drawn to the attached and natural ideals that i've always held to - homeschooling and organic foods, sleeping with my babies + breastfeeding my toddlers; but also feeling drained by outside circumstances in my life and figuring out that things like public school, tv shows and spaghetti o's can be a necessity and a life saver. this is certainly a struggle for my right now, one that often causes rapid feelings of confusion and even guilt. but thinking and writing through some of these thoughts, i'm left with the impression that as far as my children go; they really don't care about all of these "things" and "principals" and "ideals", all they really need and want is love. sure i'd like to feel like i'm doing the best always for my children. i'd like to say that they spend their days listening to classical music and having picnics by the stream. i'd like to know that i'm working hard on reading with roman and striving to figure out if asher has allergies. but really, as far as what "kind" of mom i am, right now i'm just being the mom that i can be. my kids are watching tv while i laze around this morning and shower and drink coffee. but later, we'll go to the park - and hopefully they will have a good day for their bank of childhood memories. today is just one day filled with promise for them and for me as well. perfection and ideals can be pushed aside until tomorrow. Amen sister. I could have wrote this myself. I can't be 'that' mom that routinely takes her kid(s) to places. It's just not me. But Henry and I live a pretty well enriched life of events - even if they're just small things like picking veggies out of our own garden or going down to the park once a week. And yeah...food...oh geez. I thought for sure I'd always be able to feed Henry nothing but the best of everything. But the truth? He had marshmallows to eat before breakfast this morning and a lot of times he doesn't even eat a real dinner because I get home so late. His dinner last night was a hotdog and donuts from the gas station because we were out. That's bad. Real bad. But life happens and sometimes you just have to keep doing what you can in order to create a world around them that is the best it can be while keeping everyone happy and sane too. So yeah...all of the jumbled mess just to say that I get it. Keep doing what you have to, you're such a wonderful mom to your boys and know that it shows through everything that you do. I totally agree that small, every day things can be so enriching for little ones! Thanks for sharing your thoughts Jenn, it's good to know that other mamas can relate and your sweet words mean SO much!! Thanks, Dena - it is good to hear that other mothers feel this inadequacy as well! It's so hard to balance our expectations and desires with real-time sometimes. I have been so blessed by and fulfilled by attachment and natural parenting ideals- I believe it's the way things were designed to be, however, I have also felt very burdened by these same ideals as I realized how much sacrifice it takes to be 100% about anything. I have given myself grace in this area to live life and parent my children with as many of these ideas that are sustainable without causing guilt, grief or shame. Some days it's easier than others, and sometimes it's just plain nerve-wracking to try to do it all, but in the end, the love you're pouring out to your children, whatever that looks like, is being built up within them and that's really the best thing any of us can do. Totally get this. During pregnancy and those years before you have children, our thoughts are consumed with the exact 'type' of mom we will be, but in the end it's just about survival. If my kid gets boxed chicken nuggets one night because I'm simply too tired to cook up some organic chicken, it's not going to kill him. :) I get it though. The guilt is always there but like you said, they only know love. Survival... I love how you said that - it's SO true! Also, I love how things that moms feel guilty about can end up being fun memories for kids. I used to love when my mom would let us pick out TV dinners at the grocery! !